Eco, Umberto 1987. The Classics of Semiotics. New York: Plenum Press, 109-127. Jencks and Wigley perceive architecture beyond the context of history, form, and function. They look at architecture after modernism in the light of language and philosophy as a metaphor of life—something alive, continuous, and mandatory. Through this reading, architecture should shape and influence the whole spectrum of society through an articulated message created by the architect. Architecture is no longer about finding the solution to a utopian goal or a mere reflection of an aesthetic style. It is a metaphor that bridges the gap between the built world and the natural world, and should have an influential and immediate effect on its users. 1) Architecture oftentimes is a means of survival. From caves to primitive huts to any type of habitat sheltering the inhabitant from its predators or the environment. 2) Architecture can also be seen in terms of aesthetic forms. Different time periods idealize different forms. To give an example, the classical period idealized geometric and symmetrical forms. 3) When you take both form and function into consideration, architecture becomes a profession. A profession with design intention in both form and function. 4) And then you have Jencks and wigley, who perceive architecture beyond the context of history, form, and function. Wigley shifts to philosophy and talks about architecture through deconstruction. Jencks perceives architecture as a cultural discourse that is created from the combined reading of signs and symbols. 5) As architecture changes its function, so does the role of the architect. From builder, to artist, to a licensed architect–and finally to Wigley and Jencks. They both talk about the mediating role of the architect in helping architecture’s legibility, meaning, and reading become apparent to its users. Overtime, it is evident that architecture has always been a metaphor in some way. And the architect–with intrinsic roles as builder, artist, professional, and now mediator–becomes a schizophrenic. 1) Multivalent architecture and deconstructivist architecture differs in their relationship with the past. Jencks: Multivalent architecture is in a constant dialogue with time. The hybrid nature of multivalent architecture is about layering historical and present references (signs, symbols, metaphors) to create more possibilities in reading architecture. Wigley: Deconstructivist architecture neglects historical references because it is about stripping away excessive ornament to arrive at the architecture’s structure or core, where architecture’s inherent meaning is found in its most pristine state. 2) Multivalent architecture is about the translation of architecture through signs, symbols and metaphors. Deconstructivist architecture perceives architecture beyond metaphorical representation. Jencks: The reading of architecture through signs, symbols, and metaphors renders architecture itself as a metaphor–one that can be freely interpreted by its users. Wigley: Derridean translation is not about the representation of the original idea but the rhetoric mediating between the translation and the original work. Architecture is untranslatable as a metaphor because meaning is a result of the original and the interpreted. 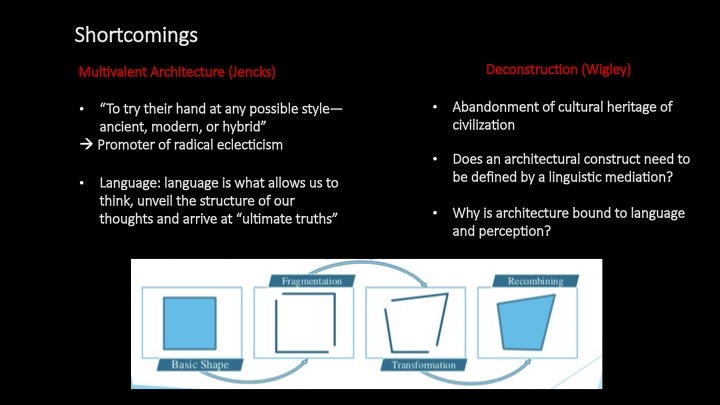 3) Multivalent architecture hybridizes elements to render more meaning whereas deconstructivist architecture is about fragmentation and the taking apart of elements to arrive at its core structure and meaning. In both cases, both Jencks and Wigley argue that architectural meaning is created through repurposing architecture–through either hybridization or fragmentation. 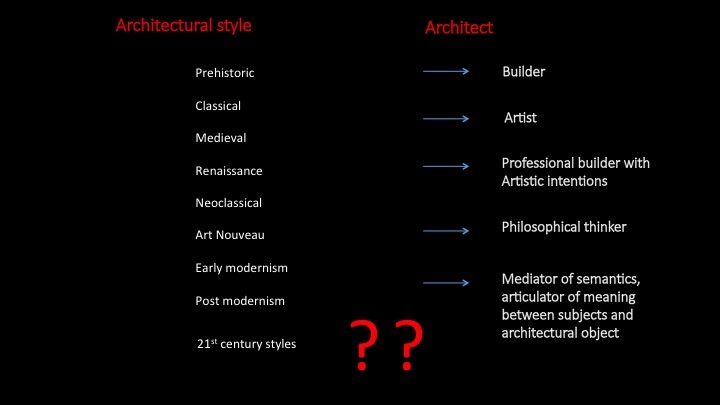 Moreover, as architecture becomes something that needs to be translated, the role of the architects shifts to a mediator. Jencks: A semantic mediation between the signifier and the signified creates a rhetoric between the user and the building. Wigley: Mediation is between the ground and the structure to identify the structural flaws which contributes to the structural necessity. 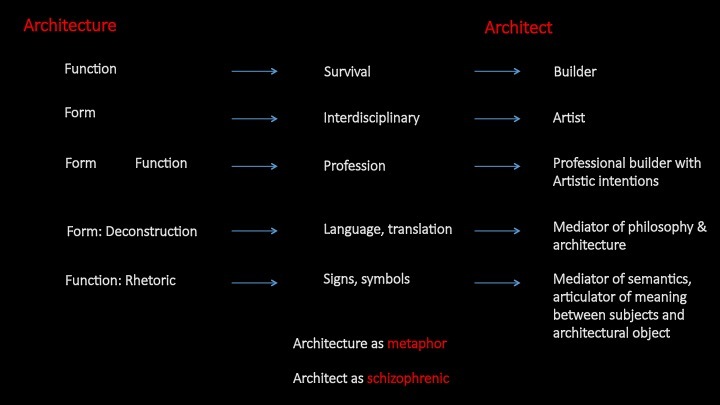 Both authors question the translation of architecture and the importance of ambiguous meaning. They do not believe in an absolute truth or unifying aesthetic style. 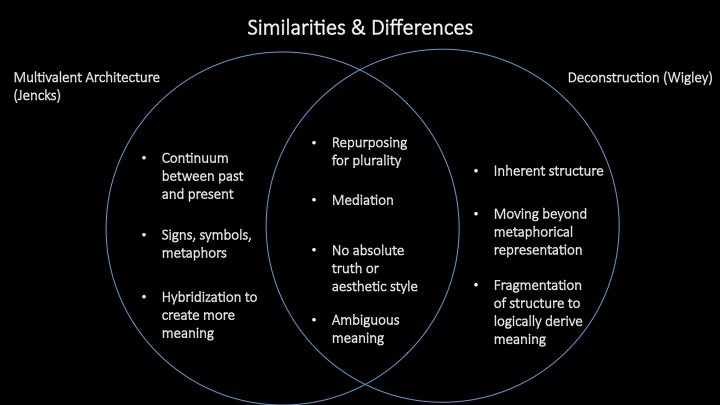 Jencks: Ambiguity in meaning in multivalent architecture allows for new interpretations. The hybrid of historical and present aesthetic styles does not render a new style. Eclectic radicalism is not a clear reading of any architectural style and thus cannot be categorized. Wigley: Ambiguity in aesthetic style is because deconstructivist architecture is concerned with architecture’s truth inherent in the structure and not applied externally through ornamentation. Looking at Gaudí’s Casa Batlló, you can see that multivalent architecture embeds a variety of signs and symbols to allow for architecture to be read openly. For example, the building’s roof tiles of multi-colored mosaics alludes to the scales on a dragon’s back. 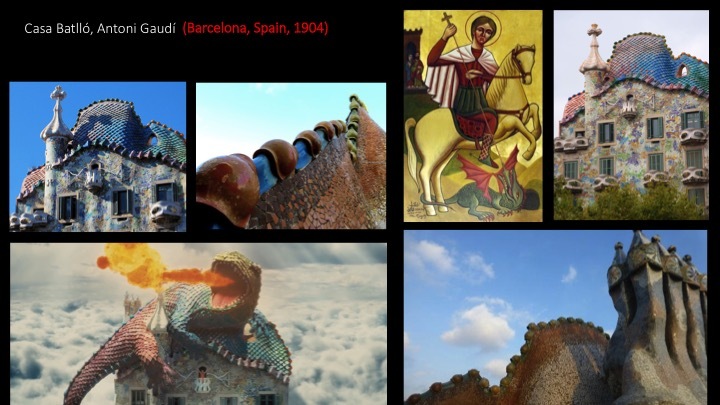 There are more symbolic–though subtle–references, such as the spine of a dragon lining the roof, or the claws of a beast as seen in the bottom right image. To elaborate on multivalent architecture’s dialogue with time, it is useful to compare the two images in the top right. The left image is of King George on a horse using a lance to slay dragons. The right image shows the tower turret of Casa Batlló inheriting the form of King George’s lance. Reading this in conjunction with the agglomeration of dragon symbols throughout the building renders a rich narrative both meaningful in biblical (historical) and imaginative (present-day) terms. With any theory, there are loopholes and incoherencies. Jencks does not argue that architecture is not a stylistic phenomenon, but he does not reject the category of style to define and design certain forms of architecture. However, there is a problem with multivalent architecture and its attempt to derive meaning through the layering of historical references. An architecture with limitless semantic possibilities meaningful in history does not equate to more meaning when taken out of their context. Each symbolic element that exists in history has a specific purpose that is relevant to its time and place. By stripping it from its the context, the element essentially loses meaning in the transition. As a result, the combination of various meaningless symbols does not, in effect, induce more meaning. This seemingly explains why this multi-stylistic approach of radical eclecticism has been forgotten in architecture discourse today. Wigley’s discussion does not focus on style a lot because deconstruction is about finding true meaning through architecture’s structure, something inherent in an object without outside application; the structure of architecture is the grammar of language. As Derridas explains in The Grammatology of Language, the grammar is the basis of language, which makes up our thoughts and ultimately becomes our truth. Can we think through what we can’t communicate and express through language? It is ironic that both Jencks and Wigley highlight the fact that architecture is bound to language. 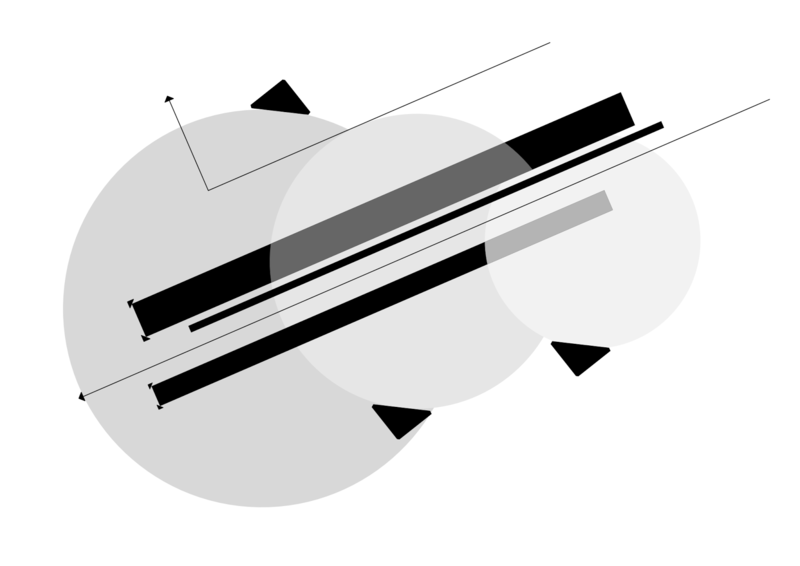 Although deconstructivists argue that it is the inherent structure rather than language defining an architectural style that makes architecture meaningful, the Deconstructivism exhibition Reconsidering Post-Modernism unconsciously put architects such as Hadid, Eisenman, Koolhaas under a stylistic umbrella as Deconstructivists. Although architecture is bound to language semiotically, it can also be branded by language connotatively. Architecture, plainly said, is the construction of a building. Hence the “de-construction” of architecture is counter-intuitive to architecture’s inherent role and consequently evokes a negative connotation. Even today, some architects categorized with deconstructivist work has refused to interpret their own work in that way. There are many facets of postmodern architecture. However, it is important to question how postmodernism will be remembered in history. Or rather, how it has changed the way architectural styles are being defined today or in the future. Has the traces of modernism blurred the lines between 1960s postmodernism and contemporary architecture of the 21st century (Or arguably, any uncategorized architecture literally post – 1960s – postmodernism ? ). It seems that deconstructivist discourse has rendered stylistic and aesthetic style unimportant, which explains why architecture has not been categorized under any stylistic “isms” thereafter. The issue has rendered architectural style of the 21st-century architecture undefined, and as a bonus, the role of the architect open to limitless interpretation. Has language, the creator of architectural styles and discourse (Corb’s manifesto gave him fame as a “modern architect”), also become the culprit in its gradual demise? I will conclude with this cumbersome question.